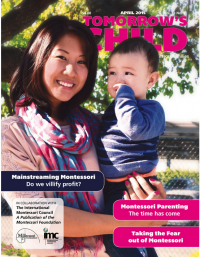 Tomorrow’s Child is the Montessori Foundation’s independent,nonprofit magazine serving Montessori schools and families around the world. What will Montessori do for my child? How can I be sure that it’s working? What exactly is my child doing at school? What can I do to support my child?s school? Tomorrow’s Child will help you understand and appreciate Montessori, and apply Montessori insights at home. Schools within the US can place an annual bulk order for their school families that includes four paper and digital issues per year. There is a minimum of 50; although small schools may contact dondinsmore@montessori.org to obtain fewer than 50. This order option includes membership in the Montessori Family Alliance equal to the number of issues ordered. Upon receipt of a school’s order, the school will receive simple instructions for your families to register for their free accounts. Schools outside the US can place an annual bulk order for their school families that includes four paper and digital issues per year. There is a minimum of 50; although small schools may contact dondinsmore@montessori.org to obtain fewer than 50. This order option includes membership in the Montessori Family Alliance equal to the number of issues ordered. Upon receipt of a school’s order, the school will receive simple instructions for your families to register for their free accounts. Schools outside the US can place an annual bulk order for their school families that includes four digital-only issues . There is a minimum of 50; although small schools may contact dondinsmore@montessori.org to obtain fewer than 50. This order option includes membership in the Montessori Family Alliance equal to the number of issues ordered. Upon receipt of a school’s order, the school will receive simple instructions for your families to register for their free accounts.